Sheryl White is a graduate of the University of Michigan’s College of Architecture and Design with a BFA and a teaching certificate. She continued courses in art at the Massachusetts College of Art. In 1994, she was an Artist in Residence at the MacDowell Colony in Peterborough, New Hampshire and in 1988 received an Artist’s Support Grant from the Lexington, MA Council for the Arts. She has had an affiliation with many galleries on the East Coast and is presently in the Corporate Lending Program of the DeCordova Museum, Lincoln, MA and two New England galleries. Her paintings are in numerous private and corporate collections including Harvard Management Company and Fidelity Management Company. She has a studio in Dorchester, MA. My abstract oil paintings begin with a precisely measured motif. 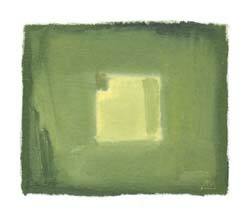 Each work starts in a prescribed way, a square in a rectangle in a rectangle. This is a structure that allows me subsequent freedom. The ratio between these plane surfaces remains the same whether the paintings are small or large. Beyond the format, context becomes important. I may use the explicit words of a title to allow a viewer into my painting, or I may use recurring motifs as shorthand to an implicit text. Paint is not just the color, but the light, shape, line, word, and belief with which I juxtapose my own personal narrative against the fixed spatial unit of my self-induced structure.